4,4'-Methylenedianiline (4,4'-MDA) Analysis Cartridge | OndaVia, Inc.
4,4'-Methylenedianiline (MDA) is used primarily for making polyurethane foams. Lower quantities are used as hardeners in epoxy resins and adhesives and in the production of high-performance polymers. MDA is a suspected carcinogen listed as a "substance of very high concern" by the European Chemicals Agency (ECHA). Most analytical methods for 4,4'-MDA involve an extraction step, purification and fractionation procedures, and analysis, usually by gas chromatography (GC) or high performance liquid chromatography (HPLC). 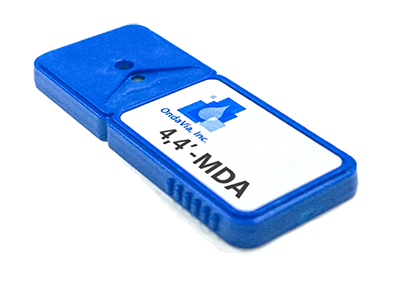 OndaVia's 4,4'-MDA Analysis Cartridges provide a simple, fast, direct measurement technique for MDA in aqueous solutions.